For other uses, see Black knight (disambiguation). 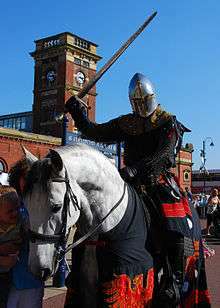 An actor playing the part of a Black Knight in the 1995 Black Knight fair in Ashton-under-Lyne. The black knight is a literary stock character, often contrasted with the knight-errant; also see white knight. The character famously appeared in Arthurian literature and has been adapted and adopted by various authors, in cinema and popular culture. The character is sometimes associated with death or darkness. Edward of Woodstock, Prince of Wales, Duke of Cornwall, Prince of Aquitaine. The eldest son of King Edward III, father to King Richard II of England, was an exceptional military leader popularly known as the "The Black Prince". James Stewart, the Black Knight of Lorn, a descendant of Robert I of Scotland, lived in the late 14th and early 15th centuries. Knights Hospitaller, distinguished by their black mantles. Zawisza the Black of Garbów also known as "the Black Knight" or "First knight of Europe", was a Polish knight and nobleman. He served as a soldier and diplomat under the Polish king Władysław II Jagiello and Hungarian-Bohemian king Sigismund of Luxembourg. During his life, he was regarded as a model of knightly virtues and was renowned for winning multiple tournaments in Europe. His nickname is due to his black hair and his custom-made, black armor, which is kept at the Jasna Góra Monastery. In 1410 he took part in the Battle of Grunwald against the Teutonic Order. In 1412 he participated in the conference between Sigismund, and Tvrtko II of Bosnia at Buda, where he won the tournament held there, with 1500 knights present. In 1416 he participated in a tournament in Perpignan in which he defeated the well-known knight/king John II of Aragon. In 1428, Zawisza, with his retinue as a commander of light horse banner of 500 horsemen, joined the forces of Sigismund in the king's war against the Ottoman Turks. During that disastrous campaign he fought the Turks at the Siege of Golubac on the Danube in modern-day Serbia. Sigismund's army was defeated by the Turkish forces. They had to retreat across the Danube, with only a few boats to ferry the troops over to safety. Zawisza's banner was guarding the retreating army. Being a man of importance, he was personally sent for by king Sigismund. He allegedly refused to retreat, disheartened by the king's apparent cowardice. He was either killed in combat or executed in Turkish captivity. Composer Edward Elgar composed a cantata titled The Black Knight. Le Morte d'Arthur by Thomas Malory: "There sat a knight all armed in black harness, and his name was the Knight of the Black Laund. Then the damosel, when she saw that knight, she bade him flee down that valley, for his horse was not saddled. Gramercy, said Beaumains, for always ye would have me a coward. With that the Black Knight, when she came nigh him, spake and said, Damosel, have ye brought this knight of King Arthur to be your champion? Nay, fair knight, said she, this is but a kitchen knave that was fed in King Arthur's kitchen for alms. Why cometh he, said the knight, in such array? it is shame that he beareth you company. " Ivanhoe by Sir Walter Scott: Richard the Lionhearted poses as an unknown black knight to avoid detection while in England, fighting alongside Ivanhoe in a tournament and helping the assault on Front-de-Boeuf's castle. Raymond Chandler in his first novel, The Big Sleep (1939), lets his private eye Philip Marlowe describe and comment on "a knight in dark armour rescuing a lady who was tied to a tree and didn't have any clothes on but some very long and convenient hair." •The GrailQuest series of adventure gamebooks by J. H. Brennan feature a character known as the Black Knight in the first three books. In the first two, however, the character turns out to be King Pellinore. In the third book, the real Black Knight is the final enemy the reader must defeat in order to complete the adventure. The Black Knights are the United States Military Academy at West Point's mascots in a number of sports teams. The Black Knight is a moniker given to golfer Gary Player in the 1960s by the media for his penchant for black attire on and off the golf course and for his courteous demeanour. The Black Knight logo identifies all the companies of the Gary Player Group. In business, a white knight is a friendly investor or savior, while a black knight is a destroyer. Typically, a black knight will enter a business or company as an influential person such as a major investor or a member of the board of directors and will dismantle a profitable or asset-rich business to enrich themselves, which typically leaves the previously profitable company in a weaker financial position. Buying of assets at inflated prices. Occasionally, the term black knight describes an investor who acquires a firm in opposition to the will of its management, as in a hostile takeover. This is only partially true as the ultimate intention of the acquirer is unknown. It could be for business reasons and not personal reasons, such as merging the entity with another entity owned by the acquirer to create synergy. Batman is often referred to as "The Dark Knight", because symbolically he is a modern-day version of a black knight. As an outcast, he works anonymously for a greater purpose, and is known to go against authorities should his mission necessitate it. Marvel Comics has legacy characters all called Black Knight, who are descended from a knight of the Round Table. The current one is Dane Whitman, a superhero who carries an enchanted sword, the Ebony Blade. He had served the Avengers at one point, among many other superhero teams. Snake Eyes, a character from G.I. Joe: A Real American Hero created by Larry Hama, is depicted as a tragic, modern, militarized and righteous black knight. Castle Crashers features several enemies as human knights dressed in black armor. Sega's Sonic Team transforms King Arthur into "The Black Knight" as a result of corruption from his immortality-inducing scabbard of Excalibur given by the Lady of the Lake in the Arthurian influenced Sonic and the Black Knight. In the Japanese versions of Fire Emblem: Shadow Dragon and the Blade of Light and its various sequels and remakes, the Black Knights are an elite order of knights led by the character Camus, who is also known as "the Black Knight". In English localization, the order was renamed the Sable Order. In Fire Emblem: Genealogy of the Holy War, the characters Eldigan and Ares are referred to as Black Knights. In Fire Emblem: Path of Radiance and Fire Emblem: Radiant Dawn, a mysterious masked man of unknown origin is known only as the Black Knight and is a major antagonist. Monty Python and the Holy Grail features a Black Knight who confronts King Arthur and, even having his four limbs severed, refuses to concede defeat. A Kid in King Arthur's Court—King Arthur's eldest daughter, Princess Sarah, is revealed at the climax of the film to have been posing as the Black Knight in an attempt to counter the villain's, Lord Belasco's, actions to usurp the throne. The Legend of Zelda: Ocarina of Time and The Legend of Zelda: Twilight Princess both feature the main antagonist, Ganondorf, dressed in a black suit of plate armor. The Black Knight Ghost is a recurring villain in the Scooby-Doo series. The Kinshra, a fictional organisation in the MMORPG RuneScape, are nicknamed 'black knights' by commoners. The Black Knight (Berserker) in Fate/Zero is none other than Lancelot of the Lake. The Black Knights in Robin Hood, the 2006–2009 BBC series, are a secret organization formed by the Sheriff of Nottingham for the purpose of overthrowing King Richard. In Huntik: Secrets & Seekers, the Titan Kilthane is based on the Black Knight. The MMORPG AdventureQuest Worlds features both an NPC and a boss called The Black Knight, the NPC being the lamenting ghost of the man who wore the armor, and the boss being the man's evil armor continuing its dark deeds. Even before Artix Entertainment released AdventureQuest Worlds, in their original game AdventureQuest there were monsters called both Dark Knights and Black Knights, with the description featuring a play on words (Dark Knight/dark night). The Black Knight has featured in the game White Knight Chronicles as an enemy's incorruptus (an incorruptus is a 7-metre-tall armor-like robot), dragon and white knights are featured as playable incorrupti. Prince Gares the Black Knight, a character from the video game Ogre Battle: The March of the Black Queen, son of the Empress Endora and a primary antagonist in the game, is a black knight capable of magically animating numerous "copies" of his signature black armor to attack the player throughout the game, thus making him appear immortal. If his real body is found, however, he can be slain permanently. Later games in the series featured a military group of the Holy Lodis Empire alternatively known as "The Dark Knights" and "The Brigade of the Radiant Cross of the Caliginous Order" (in Tactics Ogre: Let Us Cling Together and Ogre Battle 64: Person of Lordly Caliber respectively) who serve as primary antagonists to the player, the word "caliginous" connotating "dark" in the latter case. The Dark Knight is a recurring class in the Final Fantasy series. Their abilities typically include the ability to drain enemies' stats or sacrifice their own health for more power attacks. Dark Knights from the series include Leon from Final Fantasy II, Cecil Harvey from Final Fantasy IV, Goffard Gaffgarion of Final Fantasy Tactics, and Graham from Final Fantasy Dimensions. The Black Knights in the video game Dark Souls are powerful recurring enemies scattered throughout the world of Lordran. The once-proud knights of Gwyn, the Lord of Sunlight, they traveled with him when he linked the Fire, and were burned alive. As a result, their suits of armor were charred by the hot ashes, but the kindled Flame reanimated them as well. The Black Knights splintered from the Silver Knights, who chose to stay in the forsaken city of the gods, Anor Londo, to serve their goddess. Angel is an American television series, a spin-off from the television series Buffy the Vampire Slayer. The show details the ongoing trials of Angel, a vampire whose human soul was restored to him by gypsies as a punishment for the murder of one of their own. After more than a century of murder and the torture of innocents, Angel's restored soul torments him with guilt and remorse. During the first four seasons of the show, he works as a private detective in a fictionalized version of Los Angeles, California, where he and a variety of associates work to "help the helpless". Typically, this involves doing battle with evil demons. This character fits the standard Dark Knight/Black Knight profile as he lives in the shadows and helps the helpless much like Batman. The MMORPG World of Warcraft: Wrath of the Lich King has an instance called Trial of the Champion and the last encounter there is a boss named The Black Knight. Cliff Richard used the pseudonym "Black Knight" to promote a remix of his 1998 single "Can't Keep This Feeling In" to radio stations which might not otherwise have played his records, with only limited success. The main character of Code Geass becomes the front man and strategist for a militant group of rebels known as The Black Knights. In the video game Shovel Knight (2014), Black Knight is the rival of the title character. Black Knight is the name of the main female antagonist in the 3rd season of Generator Rex. She is a counterpart to the series' main anti-hero, called White Knight. Both characters are inspired by their Arthurian namesakes, though they exhibit opposite personalities. White Knight fights relentlessly for what he believes is justice, though his views aren't shared universally, and his methods are not appropriate. Black Knight fights for power, though she seems to fight for justice at first, it was revealed to be only a deception. Wikimedia Commons has media related to Zawisza Czarny z Garbowa. Beata Możejko; Sobiesław Szybkowski; Błażej Śliwiński (2003). Zawisza Czarny z Garbowa herbu Sulima. Wydawn. WiM. ISBN 978-83-918873-4-9. Klubówna, Anna (1974). Zawisza Czarny w historii i legendzie. Ludowa Spółdzielnia Wydawnicza. Beliniak, Katarzyna (2007). Zawisza Czarny - człowiek legenda. De Agostini Polska. ISBN 978-83-248-0627-0. Stefan M. Kuczyński (1983). Zawisza Czarny: powieść historyczna. Śląsk. ISBN 978-83-216-0317-9. Kozielewski, Ignacy (1928). Zawisza Czarny. Dobra Prasa.